The U.S. is a hodge-podge of different regions, each with a unique personality. Thus, even in difficult economic times like these, when Europe and far-flung destinations seem impossible to afford, you can still find a world-class destination in your own backyard. Here are my top picks for places that I consider to be the classic stops you won’t find anywhere else in the world. Plus, you won’t have to spend a fortune to experience them in style. 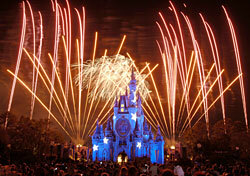 Disney World is known as the happiest place on earth, and children all over the world rejoice in its existence. Parents, on the other hand, might not feel so elated when it comes to paying for the tickets, rooms, and traveling expenses. Here’s how to feel the joy without paying a hefty price. Start by deciding whether you want to stay in one of the resorts or find lodging off-site. There are many perks to staying at Disney, such as early entrance into the parks (Magic Kingdom, Epcot, Disney’s Hollywood Studios, and Disney’s Animal Kingdom), free parking and transport, and close proximity to all things Disney. The drawback, however, is the price tag compared to hotels farther away from the parks. This is where a vacation package may be the answer. The Disney Resorts offer a slew of options for finding a package that best suits your needs. Plus, it takes some of the leg work out of having to purchase tickets and rooms separately. However, always price everything individually before booking to make sure you’re getting the best deal. Once you have a place to stay and your tickets in hand, you can create a plan of attack to make the most of your time and money at the parks. Since the four parks cover an area that’s close to the size of San Francisco, you’ll need to map out what you’ll want to see and do. My Disney Vacation is an excellent tool that will help you create an itinerary and customize your own full-color map that will be delivered to your door for free. This will make it easy to use your time to the fullest, without getting overwhelmed by all the rides, attractions, restaurants, and stores. When planning, start with each individual park and highlight what you most want to see. For instance, decide if you’d rather ride Splash Mountain or visit the Haunted Mansion in the Magic Kingdom. You’ll also want to decide if you want to visit all four parks, or just spend your time in one. A one-day ticket to one park is about $45 cheaper than a Park Hopper one-day pass. Head over to MouseSavers.com for up-to-the-minute details on the latest Disney deals and discounts. A resort package for two that includes six-days’ lodging at Disney’s Pop Century Resort, seven-day Magic Your Way base tickets, and extra perks ran about $1,025 at the time of this article. Since this deal doesn’t include airfare, two round-trip tickets from New York City to Orlando in August for mid-week travel cost $452. The basic total cost for this trip is $738.50, including most taxes, per person.